PARIS – SI Imaging Services (SIIS) of South Korea on July 6 said it had begun commercial sales of imagery from its Kompsat-3A optical Earth observation satellite, making Korea the second nation, after the United States, to put 50-centimeter-class pictures on the open market. In a statement, SIIS said Kompsat-3A, launched in March 2015, offers imagery with a ground sampling distance of less than 50 centimeters, making it the sharpest imagery available commercially with the exception of DigitalGlobe of the United States. Westminster, Colorado-based DigitalGlobe now distributes commercial imagery with a resolution as sharp as 30 centimeters. Its WorldView-4 satellite, scheduled for launch later this year, is capable of producing 25-centimeter imagery. DigitalGlobe and other companies selling satellite imagery commercially say resolution is not the Alpha and Omega of a successful geospatial-imagery business. Speed of delivery to users, revisit time, the quality of the imagery library and multiple other factors are just as important, depending on the type of customers. Nonetheless, these companies generally agree the high-resolution end of the market is where demand is increasing most rapidly, and where the business is most profitable. “The race to higher resolution still exists,” said Eric Morel, director of Airbus Defence and Space Geo-Information’s optical intelligence division. “Yes, revisit time is important, and yes, image freshness is important and we are certainly working to improve that. But the fact is that the race to higher resolution is still here,” Morel said June 29 at the Toulouse Space Show conference. Airbus shares, with the French Defense Ministry, the use of the two Pleiades optical satellites, both of which are in orbit. Operating from a 694-kilometer polar low Earth orbit, Pleiades satellites produce “native,” or untreated, imagery with a 70-centimeter resolution. Airbus sells resampled imagery, which involves laying one image over another to achieve an apparently sharper picture, at 50 centimeters in resolution. Imagery specialists say resampling does not change the size of each pixel. But Airbus says many of its customers like it. Kompsat-3A’s imaging assembly was built with assistance from Airbus Defence and Space’s German division and from the German Aerospace Center, DLR. For the global market, Airbus France is in charge of the optical images, with Airbus Germany providing Germany’s radar satellites. Kompsat-3A carries the same basic imager as the Kompsat-3 satellite launched in 2012. But Kompsat-3A operates from 528 kilometers, whereas Kompsat-3 is in a 675-kilometer orbit. Being closer to the Earth, Kompsat-3A can offer what SIIS says is “better than 50 centimeters” images, compared to 70-centimeter-resolution products from Kompsat-3. The satellite produces images with a 13-kilometer-diameter swath. 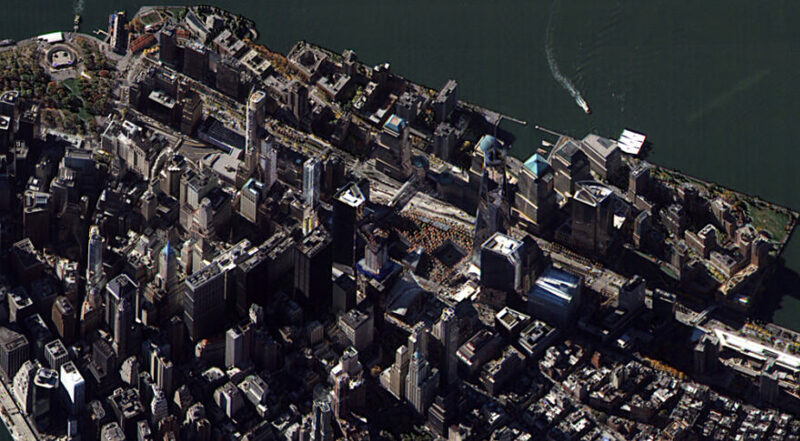 Color imagery is taken with a 2.2-meter resolution. The satellite’s infrared sensor can image at 5.5 meters. The Korean Aerospace Research Institute had billed Kompsat-3A as having a 55-centimeter resolution for black-and-white images when pointing straight down. SIIS, in response to SpaceNews inquiries, on July 7 said it would be selling 40-centimeter imagery after resampling Kompsat-3A’s native 55-centimeter pictures, the same way that Airbus Defence and Space resamples Pleiades 70-centimeter images to produce a 50-centimeter product. Israel Aircraft Industries has sold an Optsat 3000 optical Earth observation satellite to the Italian Defense Ministry as part of a trade involving Italian jet trainer aircraft. The satellite has a 38-centimeter resolution from a 450-kilometer orbit, with an 11-kilometer swath, and weighs 380 kilograms. The Italian government has signaled no intent to commercialize the imagery. IAI has said is own ImageSat International commercial Earth observation company is readying a 30-centimeter-class satellite, which is scheduled to be launched by the end of the decade. UPDATE: This story was updated on July 7 to reflect the SIIS statement that its Kompsat-3A images would have a 40-centimeter resolution after resampling.